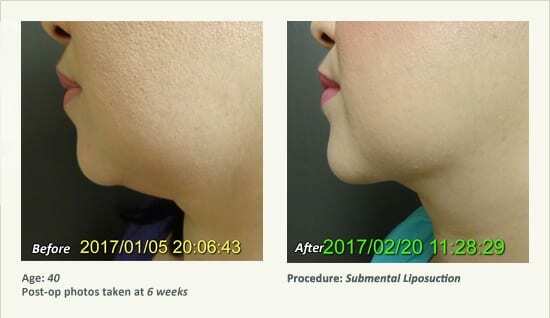 Chin Liposuction in Plano & Dallas, TX | Ronald Friedman, M.D. 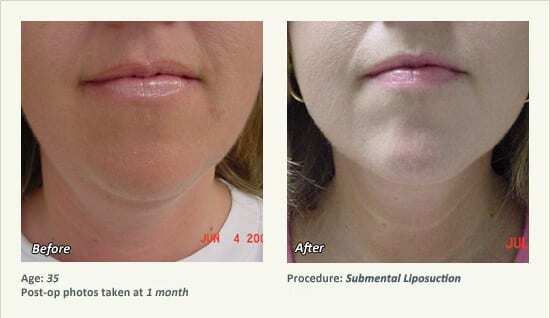 Liposuction under the chin (submental suction-assisted lipectomy) is a surgical procedure performed to remove unwanted deposits of fat from beneath the chin (“double chin”) and to improve jawline definition. 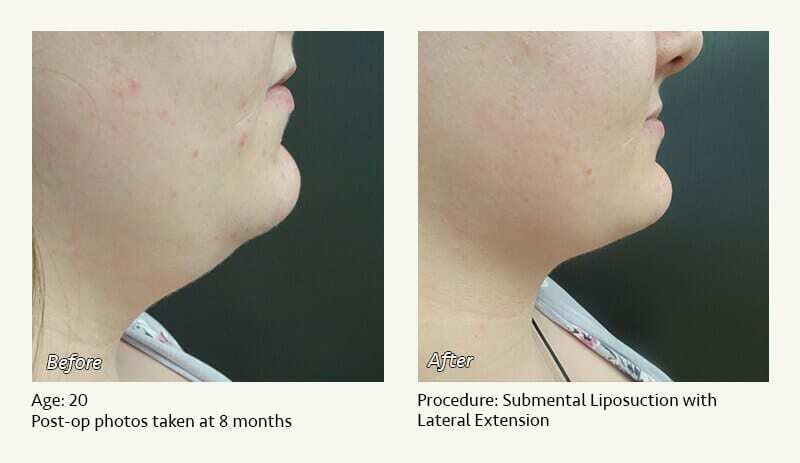 “Standard” submental liposuction is performed specifically to reduce or remove a double chin. 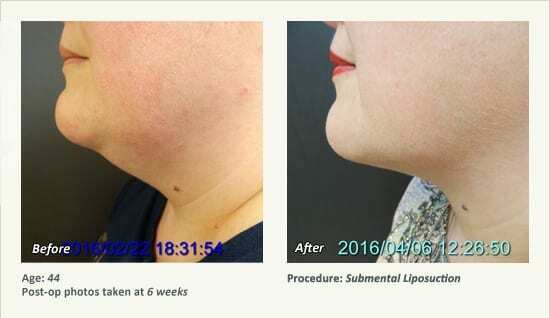 “Extended” submental liposuction is performed to remove a horizontal “band” of excessive fat that extends beneath the jawline, providing reduction in the appearance of heaviness of the neck. 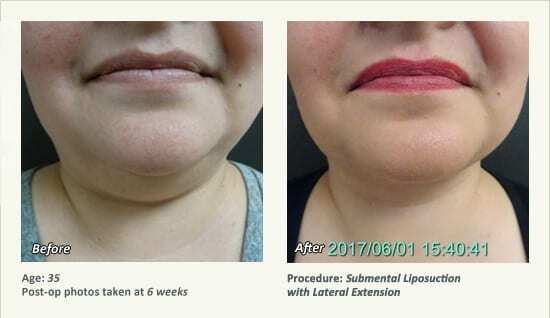 The best candidates for liposuction are individuals of relatively normal weight who have localized areas of excess fat that have not responded to dieting and exercise. 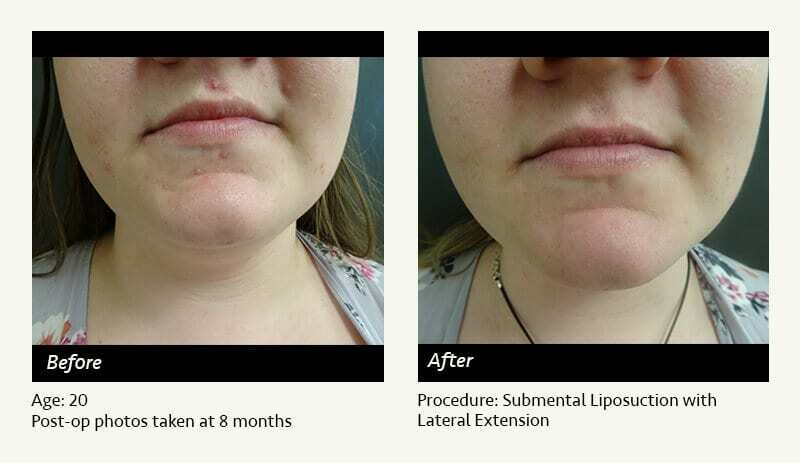 Having firm, elastic skin will generally result in a better contour following submental liposuction. In the absence of major weight loss, skin tone beneath the chin correlates most closely with age. 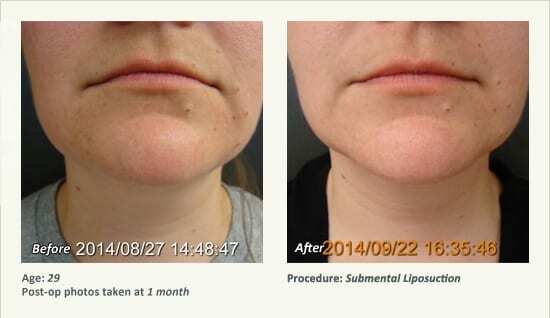 20’s or 30’s: Your skin tone is probably fine, and you will probably do well with liposuction. Early 40’s: You may still be a reasonable candidate, but your skin tone is probably only fair. Late 40’s: This is on a case-by- case basis, depending on your skin tone. 50’s: Your skin tone is probably inadequate for liposuction. 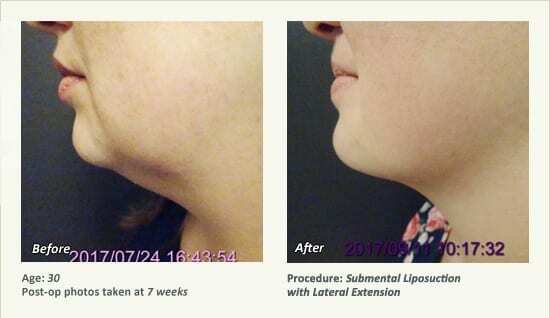 A neck lift or facelift maybe a more appropriate procedure. Chin projection. 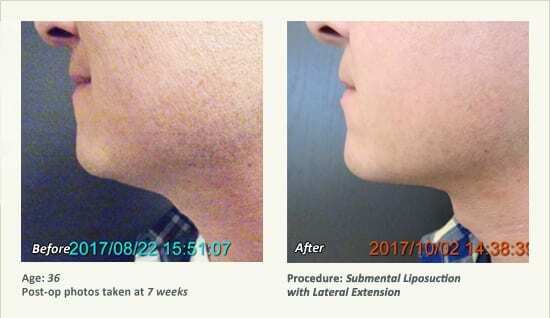 If you have poor chin projection, you may benefit from a chin implant, which will tighten the soft tissue behind the chin. Muscle anatomy: Some people with “no chin” have an anatomic variant called an obtuse cervicomental angle. 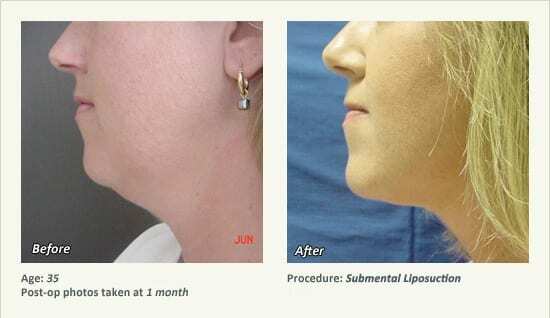 Liposuction is a reasonable procedure, but in the absence of an anterior cervicoplasty (neck lift with muscle repositioning), an “angular” neck cannot be achieved. 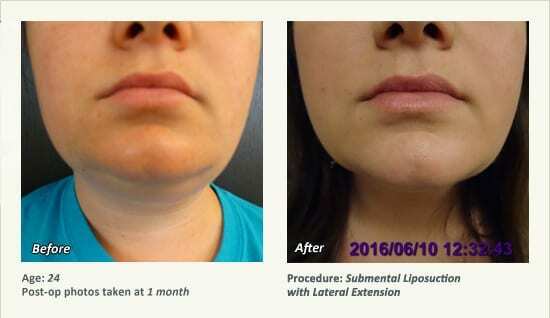 Dr. Friedman in Plano, Texas generally performs liposuction for double chin under local anesthesia (i.e. you will be awake) in our office surgical procedure room. 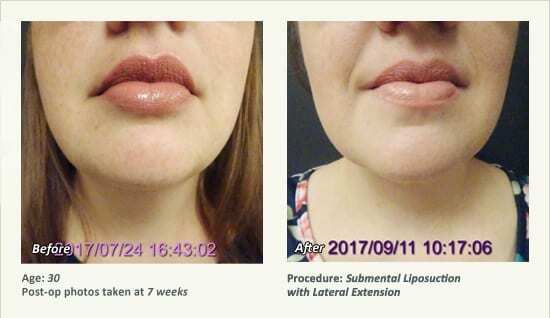 The procedure takes about 45 minutes. 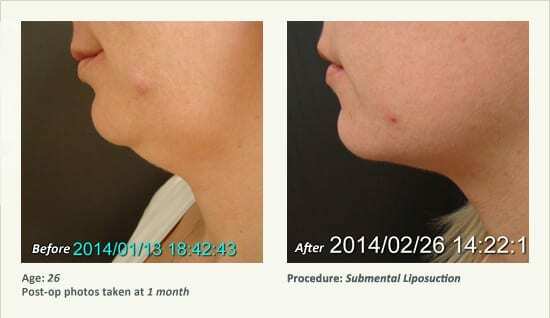 Dr. Friedman marks the excessive fat beneath your chin. The planned incision site is numbed with local anesthetic (lidocaine). 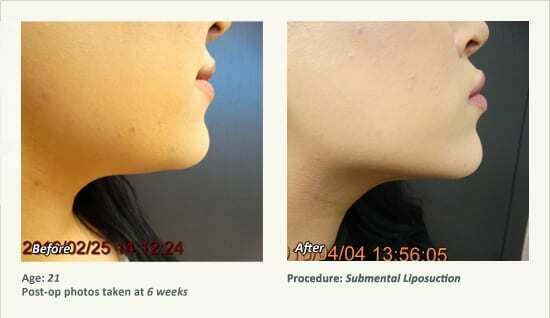 A small incision (about 4 mm or 1/6 th inch) is made under the chin. 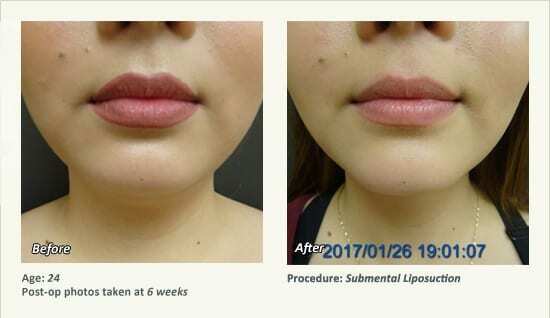 Additional local anesthetic and saline are placed through the incision into the marked fat using a 3mm (very narrow) liposuction cannula or hollow tube. At this point, you will feel like a “bullfrog,” since the fluid will cause temporary neck swelling. 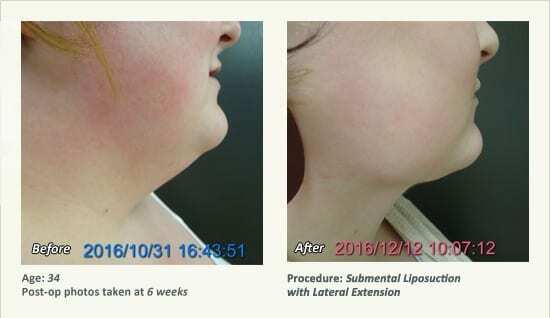 The same liposuction cannula is now used to suction out the fluid that was just injected—plus the excessive fat. The incision is closed with an internal absorbable suture. A contoured piece of thin surgical foam and a compression garment are placed. Have a family member or friend drive you home. Although you will be awake and alert, the compression garment can be a little distracting at first. You may remove the foam and garment to shower every day. However, the garment must be worn at ALL other times (24 hours daily) for the first two weeks. For an additional two weeks, it should be worn most of the time (at least 16 hours daily—so you don’t have to wear it at work). Failure to wear the compression garment will compromise the results of surgery. You must avoid heavy lifting and strenuous exercise for at least two weeks after surgery. When you visit our office in Plano, Texas, Dr. Friedman will address your specific questions and concerns. He will give you a realistic idea of what you can expect from surgery. 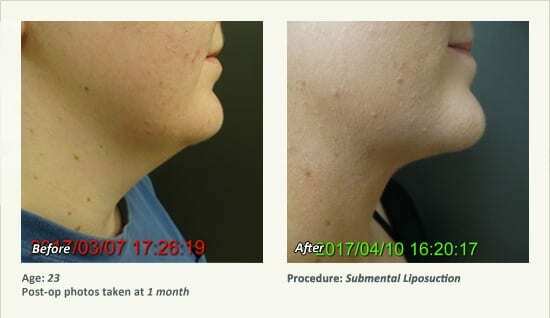 We will also show you a variety of “before and after” photos of submental liposuction procedures performed by Dr. Friedman. 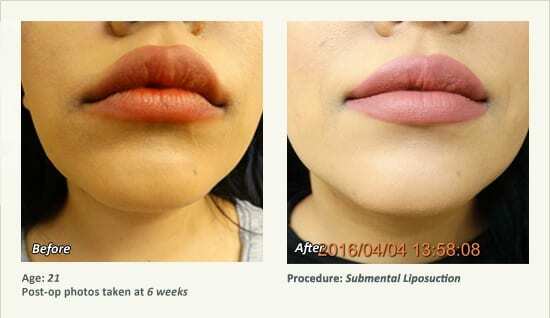 If you wish to speak to other patients who have undergone submental liposuction, we will be happy to provide phone numbers. 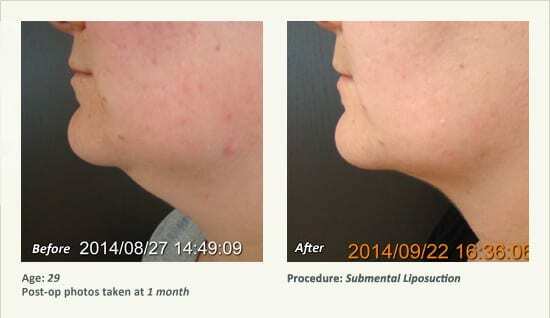 How much does liposuction under the chin cost? 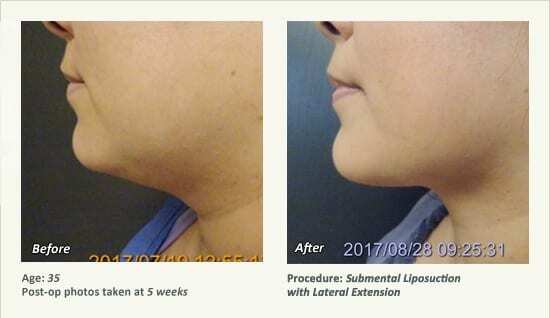 Isn’t there a nonsurgical way to remove the fat beneath my chin? 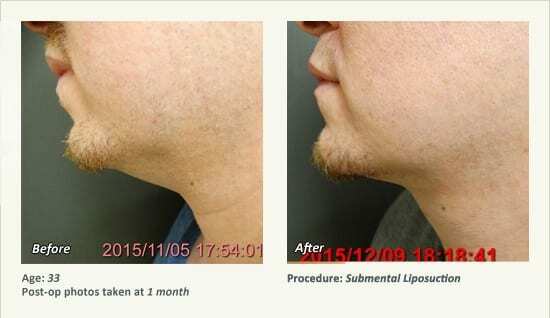 Kybella (deoxycholic acid) is an FDA-approved treatment for reduction of submental fat. 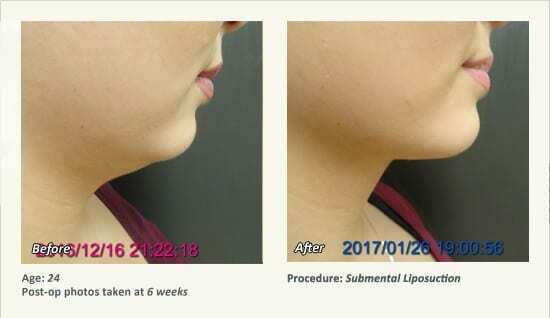 Dr. Friedman does not use Kybella due to concerns about expense (multiple treatments with Kybella are generally more expensive than liposuction), inconvenience (the neck becomes firm, red, and uncomfortable—sometimes for weeks—after each treatment), and inconsistency (Dr. Friedman has performed liposuction under the chin for multiple patients who were unhappy with their Kybella results). 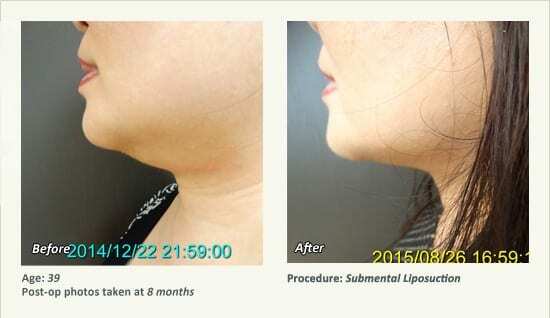 Are there different types of liposuction for the neck? Dr. Friedman in Plano, Texas, performs “conventional” liposuction, which involves removal of excessive fat by mechanical suction. 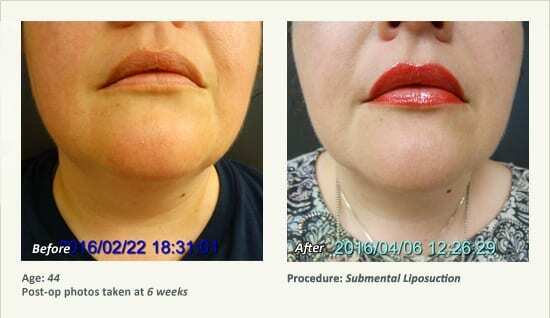 Some other physicians may use laser liposuction, which may be advantageous in patients who have reduced skin tone, as this technique is anecdotally associated with some skin tightening via tissue heating. 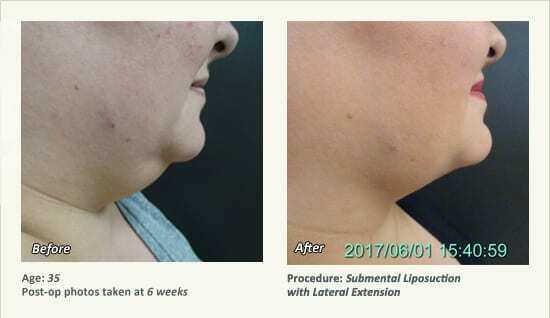 Remember that any liposuction technique can yield good or bad results. The training and experience of the surgeon performing your procedure is generally more important than the technique or machine he or she uses. Evaluate surgeons based on their experience and surgical results. The fat cells that are removed by liposuction cannot regenerate. They are gone forever. However, if you gain 20 or 30 pounds, all bets are off. The remaining fat cells will become larger, and you will regain fat. The submental region will be more resistant to weight gain than areas that were never treated. But all areas will enlarge to some degree if you gain weight after surgery. If you maintain a stable weight after surgery, your results should last for many years. 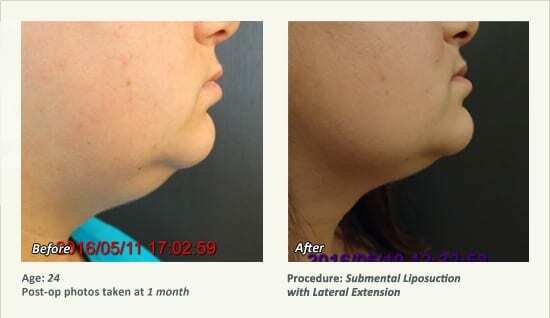 Liposculpture is nothing more than a marketing term used to describe liposuction. Many physicians advertise that they can sculpt your neck, tummy, and thighs. 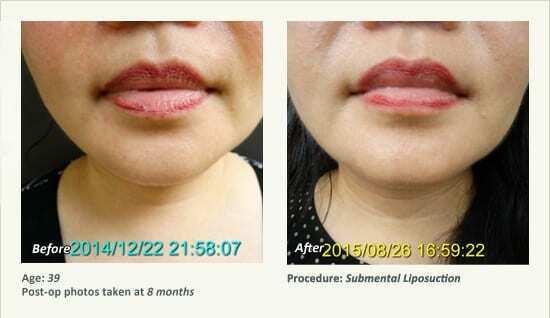 The reality is that the vast majority of liposuction surgeons have absolutely no background in art or sculpture. In contrast, Dr. Friedman’s interest in plastic surgery stems from his decades of experience as an artist and wood and marble sculptor. His artistic eye guides him in the performance of cosmetic surgery, particularly submental liposuction surgery. Arrange to have a relative or friend drive you home, as the compression garment may be a little distracting at first. Sleep with your head elevated. A couch, recliner, or extra pillows are all reasonable options.Sleep on your back (not your stomach or side). Leave the compression garment on 24/7 except for showers for the first two weeks. You may remove the garment and foam padding for 20 to 30 minutes daily to shower—but otherwise it must be on at all times. When you put the foam padding back on, make sure that your head is straight and that your chin is up as high as you can get it before placing the padding. The garment must be tight. Failure to wear the garment will compromise your surgical results. You may take Tylenol or extra-strength Tylenol for pain. Do not take aspirin, Motrin, Ibuprofen, Alleve, or any other medication that may make you bleed. Do not participate in any exercise activity (beyond simple walking) for the first two weeks. If you experience a prolonged fever (oral temperature greater than 101), contact Dr. Friedman.Please call our office or page Dr. Friedman for any other problems. Activity level – You may resume light exercise 2 weeks after surgery. You may resume unlimited exercise 4 weeks after surgery. Sleeping position – Please sleep with your head elevated for 2 weeks after surgery. Compression garment – You must wear the foam and compression garment 24/7 for the first 2 weeks. You must wear the foam and compression garment at least 16 hours daily for the second 2 weeks. This is not optional. Massage – You should massage the suctioned area with a vibrating massager starting one week after surgery. This will help smooth any irregularities and areas of firmness. Massage should be performed 30 minutes daily for about 4 to 6 weeks until all firmness has resolved. Your neck should be extended with your chin held as high up as possible while you are massaging. You can purchase a vibrating massager at Bed, Bath & Beyond, Brookstone, Sharper Image, Amazon, etc. Incision care – You have a Steristrip (butterfly tape) over your incision. After this peels off (typically about 2 weeks after surgery), begin scar massage with Prosil or Recedo twice daily. Samples are available at our front desk. The scar will be firm and elevated for at least a couple of months. Continue scar massage (with your fingers or vibrating massager) for about 3 months. Water exposure – Avoid the pool, lake, and ocean for 2 weeks.